A giraffe calf is born into this world by experiencing gravity and a shocking thud. The 5 foot plus baby giraffe must drop 6 feet or more from the mother’s womb to the ground because giraffes give birth standing up. Giraffe gestation lasts between 400 and 460 days and usually a single calf is born. A giraffe calf is able to walk almost immediately after birth and can run after several hours, but it spends the first 2 weeks lying down protected by the mother. The calf during this time is easy prey to predators such as lions, leopards, and wild dogs. It is thought that the giraffe’s spotted pattern provides some camouflage during this vulnerable period. 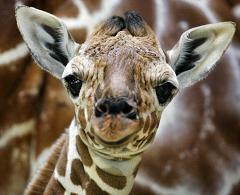 Sadly, only about half of giraffe calves reach adulthood. Welcome to the Real World, Spot Boy. How Does Immunization Of a Pregnant Woman Give the Baby Immunity To Disease When It Is Born?